Last winter, the market for closers in baseball was the most lucrative it had ever been. Greg Holland is betting on that being the case again this offseason. Holland has decided not to exercise his $15 million option to stay with the Colorado Rockies in 2018. Instead, he will hit the free agent market and pursue a long-term deal. Just a few years ago, Holland was one of the top closers in baseball as a member of the Kansas City Royals. However, he missed the entire 2016 season after undergoing Tommy John surgery. The Royals released him while he rehabbed the injury, making him a free agent for the first time in his career. Holland ended up signing with the Rockies for one year and $7 million. The contract also included a player option of $15 million if Holland hit certain benchmarks. Holland had no problem hitting those benchmarks, appearing in 61 games and recording 41 saves. Despite going through some struggles during the month of August, Holland was impressive in his return from Tommy John surgery. He made the all-star team for the third time in his career. Despite his August struggles, posted a 3.61 ERA, helping the Rockies reach the Wild Card Game. His 2017 season was good enough to make the 32-year old think that he can do better than a one-year, $15 million contract on the open market. 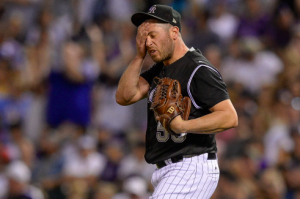 The Rockies were fully expecting Holland to decline his option and explore other options. Of course, Holland opting out of his deal with the Rockies doesn’t mean he won’t return to Colorado in 2018. The Rockies may make him a qualifying offer of $17.4 million to see if that’s enough money to make him come back for another year. Colorado is also likely to be among his suitors on the open market. If the Rockies can’t re-sign Holland, it’s unclear who their closer would be heading into next season. “I do believe we will be in touch with Holland’s representatives about next year,” Rockies GM Jeff Bridich said last month. Last offseason, closers Aroldis Chapman, Kenley Jansen, and Mark Melancon all signed lucrative, long-term deals. Holland was considered to be a second-tier closer compared to that trio, primarily because he missed all of 2016. But this offseason, Holland is considered to be one of the top closers available in free agency along with former Royals teammate Wade Davis. Early projections have Holland signing a four-year deal worth around $50 million. That’s obviusly a projection and not a guarantee. But it’s a virtual certainty that Holland will sign a multi-year deal. It should help that there are no other relievers in free agency outside of Davis who worked exclusively as a closer this past season. Aside from the Rockies, teams that are expected to be in the market for a closer this winter include the Astros, Braves, Cardinals, Cubs, Nationals, Rangers and Twins. It’s likely that Holland will end up with one of those teams after becoming a free agent for the second straight offseason.